Dinosaurs hold a fascination like few other creatures. Perhaps it is because of their exotic and tragic rise to dominance and their meteoric plummet to obscurity. Maybe it is because of their impossibly creative adaptations to their environment leading to frills, fans, and pointy bits in unexpected places. It might even be that they reveal our own future to us. Whatever the reason, dinosaurs still rule. In the news yesterday, a man was arrested for stealing a dinosaur. Not a Jurassic Park living model, but a fossil excavated from private land in Montana. A few years back I took my family on a dinosaur-based trip to the west. Trundling across the endlessly flat eastern half of Wyoming, I insisted that we turn down a rutted and washed out dirt road to an obscure site where dinosaur footprints had recently been discovered. Rolling into Red Gulch (seriously! ), we were, surprisingly, not the only people there. Staring down at my feet next to the fossilized prints of some ancient carnivore was like feeling the very pulse of evolution. There was no fear of divine retribution here, just a sense of tangible continuity with a long and very distant relative on the tree of life. Creationists insist that dinosaurs and other creatures were each separately created, fearing, I suppose, an interspecies miscegenation, in keeping with their overall fear of sexuality. I was envisioning myself shaking claws with cousin dilophosaurus. Over the years we’ve made many dinosaur trips, stopping at dinosaur museums in North and South Dakota, Montana, and Colorado. Once, at Makoshika State Park in Montana, where you can walk along and see dinosaur fossils in situ, we heard a couple exclaim to the flustered park ranger, “but how can that be when the world is only 6000 years old?” Dinosaurs are symbols. They represent the ultimate in stature and environmental dominance, while at the same time hosting brains that struggled to rival a humble grapefruit. As I read the other, more serious, headlines I realize how much we are like our very distant cousins. 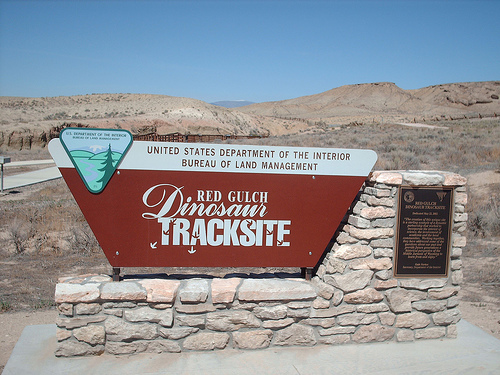 This entry was posted in Animals, Bibliolatry, Creationism, Current Events, Evolution, Posts, Travel and tagged Creationists, dinosaurs, Jurassic Park, Makoshika State Park, Montana, Red Gulch Dinosaur Trackway, Wyoming by Steve Wiggins. Bookmark the permalink.